My first Auto PC based on a Windows XP platform and a simple .NET application with touch-screen friendly access to Windows Media Player 9 and Microsoft Mappoint 2002. At various times I've felt the need for an mp3 player and a navigation system in my Ford Explorer so I've decided to build a multifunction system based on a PC platform. Came across Matthew Lee's Auto PC Weblog and found it a good starting point for my research. I've been researching options for the CPU platform. I need something that is small, low-power, preferably fan-less, and with decent horsepower. I briefly consider going with an Apple G4 Cube but at $500 it will blow my budget completely. 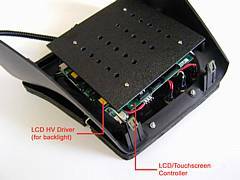 I've been looking into embedded StrongARM kits that run Linux or Windows CE but these are expensive and will require considerable hardware and software development. I looked at some small form factor desktops from Dell and HP, but the price is an issue, and these are AC powered, requiring an inverter. 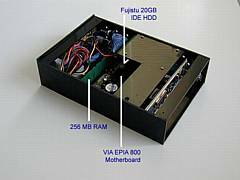 I've decided to follow Matt's choice and go for a VIA EPIA C3 800 Mini-ITX motherboard in a Casetronic mini ITX-2677 case. The motherboard is slightly faster than what he used and I figure the extra processing power will be necessary for Windows XP Professional. Both the case and the motherboard are available from iDOTpc. The Inquirer has a good review of the VIA EPIA 5000 and EPIA 800 motherboards. iDOTpc also offers the combination as a desktop computer called iBox. 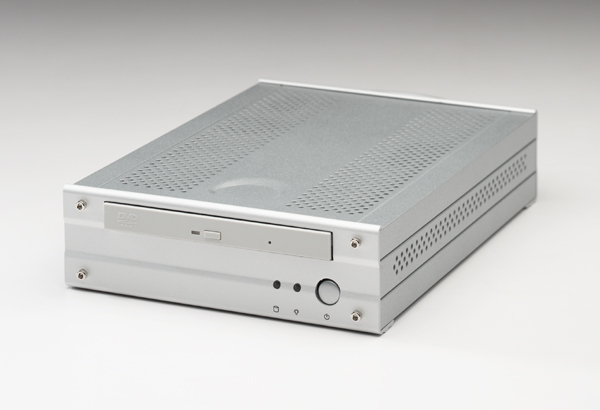 The iBox ITX-VIA Slim Box can be configured with different processors, hard drives and memory. I figure I will go for this without the hard drive (I have a 60GB IBM drive languishing) and with 256 MB memory. Windows XP Pro is $165 with the iBox which is a good price, although I have sometimes seen it cheaper on eBay. Found another auto computer site while searching for LCD displays. One system described here uses a display from Parts Express. This store has a good selection of LCD displays. Almost all displays I've looked at are really TV monitors. While the VIA motherboard I will use has a built-in TV out, I'd really like to get a VGA LCD monitor, preferably one with a capacitive touchscreen. The Datalux LMV10 looks like a nice display, but I have been unable to find pricing in retail stores. After looking at the TV output of the VIA EPIA motherboard on my home television and camcorder displays I've decided to abandon LCD TV monitors as an option. Even though VGA monitors are about twice the cost of TV monitors for the same diagonal size, I believe it will be money well spent. After more research I determined that both the Xenarc 700TS/TSV and the Datalux LMV10 may be unsuitable for daylight operation in my vehicle. The brightness of both these displays is under 200 cd/m2, and at least 300 cd/m2 is recommended. 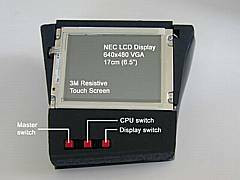 The best LCD I've found is the 6.5" NEC NL6448BC20-08. It is availabe as the XLK-5002T kit from EarthLCD with a 3M resistive touch glass. I've been looking for GPS mapping software that includes an API. More on why I need an API later. Despite being packed with excellent maps and other features, I've had to look beyond Microsoft Streets and Trips, Rand McNally StreetFinder and TripMaker, and Delorme Street Atlas for lacking an API. TeleType GPS Software includes a basic API and an SDK. The API is very basic though and only allows access to some menu commands. Streets On A Disk is a mapping software from Klynas Engineering with a fairly comprehensive API. Klynas offers a free download of a demo version with the API and some sample maps. I was able to input addresses, calculate routes and retrieve travel reports using the Win32 API from Python and C# applications. I have decided to go with Microsoft Mappoint though because it offers rich map data and an easy to use .NET plugin. Until my evaluation copy of Mappoint arrives from Microsoft I'll use Streets and Trips. The factory radio in my Ford Explorer does not feature auxiliary inputs. Not wanting the replace this radio I started looking for other options to interface the PC with the car stereo system, preferably using the radio's CD changer port. Precision Interface Electronics (PIE) makes an adapter that does exactly this. 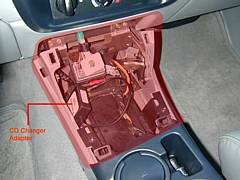 It appears as a CD changer to the factory radio and provides RCA inputs to connect any audio source. I purchased the FRDF-AUX model from LogJam Electronics. Works perfectly! In searching for an inexpensive, compact USB GPS receiver I only found one at Deluo Electronics. The good folks at Deluo shipped my order very prompty. I tested it with Microsoft Mappoint and it works fine. To avoid using a virtual keyboard for logon I decided to go in for an inexpensive biometric scanner. I opted for the U.are.U Personal fingerprint scanner by digitalPersona. This is a USB device that works with Windows XP. I got mine from CDW. The Casetronics case is too big to fit into any existing crevice under the seats or in the center console. I had originally thought I'd put this in the rear but this will result in too many cables running along the length of the cabin - power, video, serial (for touchscreen), USB (for fingerprint scanner), and audio. Using the native Windows XP GUI for the music player (WMP), Streets and Trips, etc. is painful. The widgets are too small for touchscreen use, and a stylus is not practical. I'm not satisfied with the GPS support in Streets and Trips; the map is not updated constantly in real-time. I believe this is a restriction Microsoft had to put in for licensing requirements. I'm hoping this is not the case with MapPoint. I can't have the computer booted up before I start the vehicle; insufficient current is available to the CPU during ignition and it turns off. A large capacitor may do the trick - I need to experiment with this. I also need the power and reset switches by the console. It has been over a month since the first test drive but I'm almost finished with the new CPU enclosure. 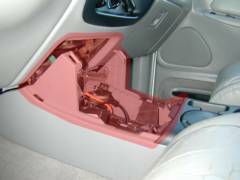 The only concealed space I had for the CPU enclosure was the center console storage area where the factory CD changer is installed. The compartment is about 10.5"L x 5.5"W x 7"D. The CD changer is 10.5"L x 2.5"W x 6.5"D and takes up just under half the space. I pulled out the CD changer to make room for the CPU. and the HDD is under the L-shaped panel. Unable to find a suitable plastic or metal enclosure with the same dimensions as the CD-changer, I decided to make a custom case using ABS. I was lucky to find a dealer right in my neighborhood. The friendly folks at TAP Plastics cut the 1/8" sheets of ABS to size, and all I had to do was drill and cut notches and glue the pieces together. Here are a some of pictures of the CPU case without the cover. It measures 10.5"L x 2.5"W x 7"D and is just the right size for the VIA motherboard, Morex DC power supply and the 2.5" HDD. About thirty 4mm diameter holes on the sides along the length allow air flow and I don't expect a fan to be necessary. As you can see from the pictures there is no CD-ROM drive. At the moment I connect a slim CD-ROM drive as necessary to load software (Windows XP, MapPoint, etc.). I hope to incorporate the drive into the case in a subsequent revision. The only reasonable place to mount the display and control panel (i.e. switches) in my 1997 Ford Explorer was the front of the center console just below the A/C switch panel. This actually turned out very convenient because power was readily available at a cigarette lighter plug on the right, and the video and control cables could be completely hidden under the center console. Furthermore at this location there is less glare on the display during sunlight, and the touchscreen and switches are easily accessible. Mounting the LCD and its controller boards turned out to be quite a challenge. I needed a way to securely mount the controller boards, the LCD and three switches in a fairly tight space in the front console area. Top view of finished console module. an ABS sheet attached to the module. I had to leave out the switch panel in the end to fit everything within the space available. This is not a big issue right now except that the LCD operates at a fairly high brightness level, necessary during daylight use, but a little too bright after sunset. Bottom view of finished console module. the module with spacers and long screws. I mounted the LCD and switches on one side of a 1/8" sheet of ABS cut to fit the shape and contours of the original console section. Fortunately this section had a removable storage cup that I discarded and was able to use the rest of the shell. I mounted the main controller board, HV driver board, and a small general purpose PCB on the other side of the ABS sheet using spacers. The general purpose PCB, hidden below the controller card in the picture on the left, houses a 4-pin connector to provide power and power switch connections to the CPU unit, and PC-mount connectors to connect to the switches, power supply and controller board. Replaced the homemade ABS case with a Casetronic C136. This case is 7"W X 2"D x 10"L and fits comfortably in the center console storage. It is actually 0.5" thinner than my homemade case and significantly stronger. I wish this case was available last year when I really needed one. I spent too many hours working on the homemade case in my garage! I developed a user interface using C# and .NET earlier this year. It provides an interface to Windows Media Player and Mappoint 2002 complete with UI controls designed for touchscreen use. Unfortunately when I upgraded to .NET 1.1 I found that several things broke. To make things worse I didn't maintain a source repository so while I began fixing things for .NET 1.1 compatibility I lost the original source and can't revert to .NET 1.0 either. I hope to fix everything and re-architect some aspects to improve synchronization with my home desktop (for music and maps). During the first test drive almost a year ago I discovered that even though the CPU received power when the car was turned off (design intent), the voltage dip during ignition was sufficient to cause a reboot. To address this problem I put in a 0.6F capacitor bank in April to provide sufficient power to the CPU during the ignition cycle. I could now turn off the ignition, run short errands, and restart the car, while leaving the CPU running continuously. The capacitor bank worked flawlessly until this past month when it started to occasionally fail to provide sufficient charge and cause a reboot. For the past two days it appears quite dead. I suspect that one or more of the 10 68000μF capacitors are dead and the bank can no longer provide the required 2A of current. Or perhaps during my 2000 mile drive from San Jose to Dallas a dry solder separated and disconnected a capacitor. I still haven't had time to update the software, and this is another work item to add to the list. Xenarc has a couple of systems that are a good fit for an auto computer. The MP-SC1 is actually branded as a Car PC, while the MP-TX1 is a described as a mini PC. The systems can be purchased direct from Xenarc and their current prices are about $100 more expensive than a comparable VIA EPIA based system. Both the Xenarc systems are smaller than the smallest VIA EPIA cases I've found so they do have an advantage there. I can't find information on power consumption of the Xenarc systems. My current Auto PC is based on a 800 MHz VIA EPIA C3 and requires less than 2A during normal operation. Over the holidays I've had a chance to discuss my ideas on car computing with new and old friends and it has renewed my interest in developing version 2 and incorporating the features I've come up with. Shortly after a demo of Explorer-I to my friends the LCD stopped working, or so it seemed at the time. I ordered a Xenarc 700TS as a replacement but was eventually able to repair the original NEC display. It turned out to be a loose connection in the cable from the controller to the display. I had originally rejected the Xenarc 700TS because of its unsufficient brightness but Xenarc has since increased it to 280 cd/m2 with the touchscreen. Unfortunately the VIA EPIA 800's built-in VGA graphics does not support the 16:9 (800x480) resolution of the 700TS so I'll have to manage with a stretched 640x480. It doesn't look too bad though. I've also decided to abandon the capacitor bank system and a custom BasicStamp-based power sequencer and use an off-the-shelf power sequencer instead. I ordered the ITPS Auto Power Sequencer from mini-box.com. 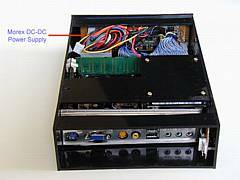 I've also ordered another EPIA 800 board with the compact PW-60 power supply to construct a second prototype unit. I like the M-100 unit but both the length and width are just over 7.5" and I can't house it in the center console of my Explorer. I'll have to stick with the Casetronic Travla C136 case or build my own. I keep an eye out for small form factor (SFF) systems that are under 10"x7"x5" because that is about the size of the center console compartment of my vehicle. Came across a P4-based system today called Mipi. At 10.24"x6.7"x3.4" it is one of the smallest P4-based SFF systems I've seen and can accomodate a standard 3.5" HDD in addition to a 2.5" slim drive! The only store I found that carries it is servercase.com and it costs $310. The Freetech P8F162 motherboard features a 533 MHz FSB, DDR333 memory and supports Hyper-Threading. I'm not sure if it will run directly off the 12V car battery though because the supplied power adapter outputs 17VDC. While somewhat more expensive and power hungry than a VIA EPIA- based system it is significantly faster and will also boot and shutdown more rapidly. Damien Stolarz has a presentation on in-car computing: In-Car Computer presentation.